Participants at the just ended Multi-stakeholder Anti-Corruption Strategic Meeting on the Right to Information (RTI) have renewed their call on the President Nana Addo Dankwa Akufo-Addo to ensure the passage of the RTI Bill. The group urged government to place the RTI Bill on the calendar of the current Parliament before the end of the first quarter of this year. They hinted that if governments failed to do that, they would resolve to embark on various lawful public actions, beginning from today, February 12, 2018, to mobilise the people of Ghana behind and in support of the call for passage of an effective and robust right to information legislation in Ghana before the end of the third quarter of this year 2018. This was contained in a communiquÃ© issued by the group at the end of their meeting, which brought together coalition of civil societies, policy think-tanks, trade unions and the media in Accra on Monday. 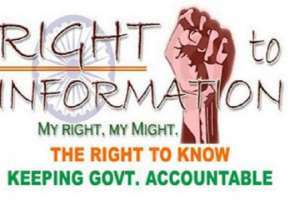 'We have observed with disappointment the continuing failure of government to submit to Parliament and ensure passage of the Right to Information ('RTI') Bill, despite the President's repeated assurances of his commitment to fight corruption,' it said. 'We note the fact that mention of the RTI Bill was completely missing from the State of the Nation's Address delivered by H.E President Nana Addo Dankwa Akufo-Addo on Thursday 8th February 2018,' it said. The communiquÃ© noted that, after one year in office, the Akufo-Addo government had given no indication as to the current status of the RTI Bill or as to whether government intends or proposes to place the RTI on the calendar of the 7th Parliament and have it passed this year. It reminded government of its many promises made since assuming office in January 2017, to ensure speedy passage of the RTI Bill, including the assurance given by Vice President Dr. Mahamudu Bawumia at the Transparency International Regional meeting in Accra in February 2017 that government would ensure passage of the RTI Bill by the end of 2017. The communiquÃ© said the RTI Bill was necessary to make credible and effective existing anti-corruption legislation, including the Office of the Special Prosecutor Act and the Whistle blower Act. It said the passage of RTI Bill would help address the public financial management institutional weaknesses noted in the recently concluded Auditor General report on the liabilities of Ministries, Department, and Agencies ending 31st December 2016.